It's been a very long time since Canados offered something under fifteen meters, and sporty. 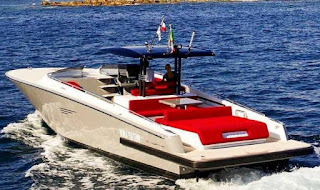 Yet the Canados 428 Gladiator comes ablaze with interesting day cruiser features, and various cool options to the customer. Forget the thirteen meter size this is another Canados made to order product with interesting options from the fifteen custom Dupont color choices, to the propulsion offer of stern drive or faster surface drives set up. The Canados 428 Gladiator is a day cruiser, but also tender and a lot of things that you can have in between these two categories. Inside the Canados offers an open cabin layout with a large forward berth, spacious shower head, and a galley. Power choices for the Gladiator 428 are standard twin Volvo 400hp with stern drives, and or optional Cummins 550hp with surface drive set up.